As soon as my active duty spouse leaves on deployment, the reality of his departure sets in. Of course, his farewell invites a visit from those pesky deployment gnomes, which means something unexpected will occur. Maybe the goldfish dies. Perhaps the washing machine overflows. Quite possibly, my car will have a flat tire. Within the first day or in that initial first week, something random comes up. It happens. Every. Time. Due to the spontaneous moments of this military life, I’m learning that, in times of need, I’ll have to reach out. It’s often difficult for me to ask for help as I have grown to become an “I'll handle it myself” sort of person. However, when it comes to maintaining our assets – where we live and what we drive – it’s important that I have names and numbers in mind to keep things running smoothly. If you're in the same shoes as I am and anticipating a potential deployment, many groups and organizations are willing and able to support military members, spouses, and families. Following are a few contacts I’ve found for help during deployment. The office usually recommends Military OneSource as an option to answer any questions that come along. Access everything from confidential counseling to career guidance. To keep your vehicle in top performance, enroll in the “Car Care Because We Care” program, for a complimentary oil change. If your vehicle needs repair beyond a routine oil change, coordinate an appointment with your mechanic on the same day that the base offers the “Give Parents A Break” program. With a voucher from the Readiness office, receive a day of free childcare at the base Child Development Center or Youth Center. For a dose of kindness and friendly support, it’s worth stopping by the Family Readiness office at your military installation. While stationed in Massachusetts, we were caught up in a substantial snowstorm. Although not as legendary as the 108 inches of winter wonderland that had fallen the year before, it was still an abundant amount of heavy, wet snow. When the fluffy flakes began to taper off, kindhearted neighbors from all around base housing worked together to scoop driveways and clear sidewalks. It was like a scene from a feel-good movie! Living off base at our current assignment, those living nearby are polite, but they keep to themselves. That’s where a program like GreenCare for Troops and SnowCare for Troops could help. By registering on the Project EverGreen website, you can get complimentary lawn care service and snow removal. As detailed in our post, Free Yard Care for Deployed Troops and Disabled Veterans, GreenCare for Troops has greater than 4,000 contractors who volunteer to be paired with military families. Sponsored by the Toro lawn equipment company and the BOSS snowplow company, this outstanding program could be a big help over the colder months. Spending a rainy Saturday afternoon sipping tea and surfing online, I landed on Operation We Are Here. This supportive site lists groups and organizations all around the country willing to support active duty members and veterans. Military families assigned to Camp Pendleton, California can join the Our Heroes Journey program, pairing with a person in the local community. This connection is particularly important when it’s time for a deployment. For example, when unexpected breakdowns happen around the house, a spouse can call the local person who “adopted” them for the inside scoop on local repair companies. Having a supportive resource to turn to can make a deployment go a little more smoothly. Moving across the map towards the Midwest, good things are happening with the Red Team in Ames, Iowa. A military family stationed at Camp Dodge or Fort Des Moines will find a network of support only a country mile or two away. 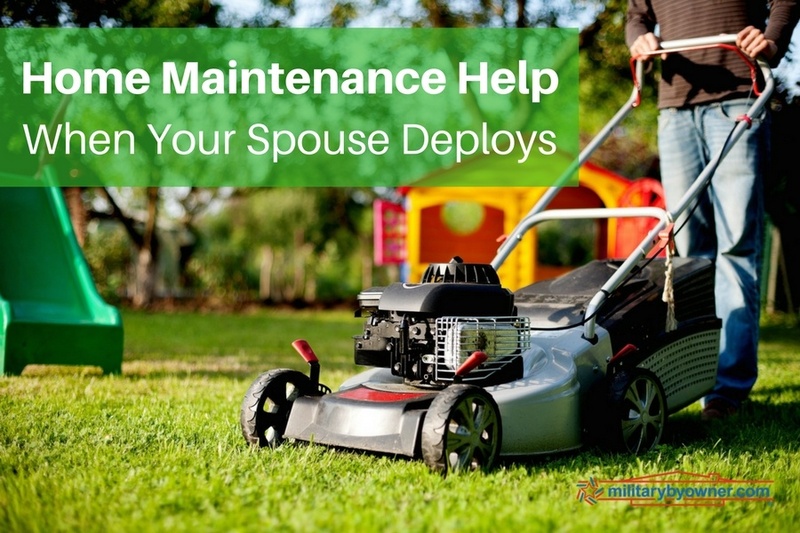 When their service member deploys, the military spouse and family can contact this motivated team of volunteers for assistance with the basic upkeep of their home. On a similar note, in states such as Ohio and Kentucky, volunteer groups are galvanizing in support of military members, spouses, and families. Toledo, Ohio’s Heroes In Action and Louisville, Kentucky’s Active Heroes offer a wide array of resources to help ease the stress of a deployment for a military family. It’s heartwarming to know people with a giving spirit are willing to assist with any home repairs that may occur. Among the bevy of organizations that support military members, spouses, and families, the Operation Homefront Mid-Atlantic branch has made a positive impact. For instance, when the active duty member is away and the water heater starts a slow leak or the air conditioner begins acting up, it’s comforting for a spouse to know there’s someone they can call for help. As with many of the military-friendly groups around the nation, beyond requests for need, a variety of events and activities are connecting members of the military community with volunteers. If, like me, you can navigate fix-it projects but need a little guidance or expertise when it comes to repairs, consider the resources mentioned here. Especially during a deployment, it’s okay to ask for help! There’s no need to face challenges alone when so many helping hands are available. An added plus? By reaching out to others, you can feel more of a connection to the community at your assignment.